The DiNotte XML-3 is ideal for bar or helmet use (click to enlarge). The DiNotte XML-3 is a 1500 Lumen light that is ideal for bar or helmet use. 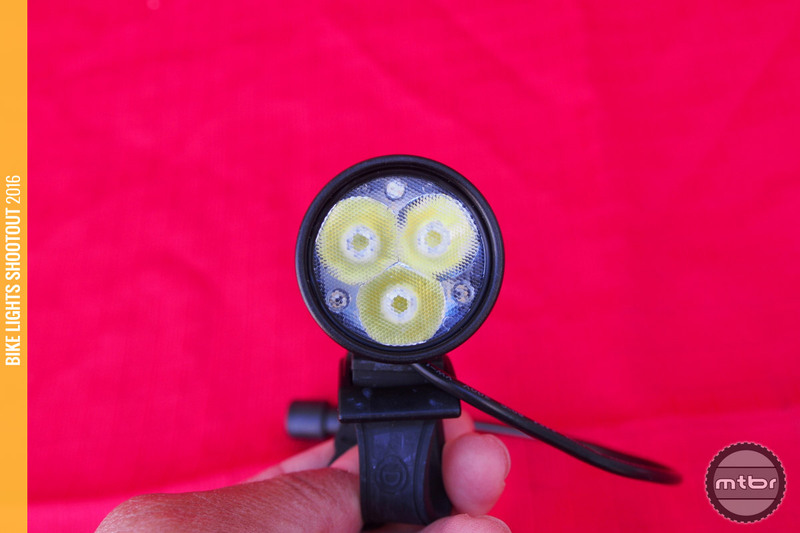 Weighing in at 355 grams, it lasts 2:30 hours on full power or 5 hours at a very capable 700 Lumens, and it’s ideal for most of your post-daylight bike adventures. I have a pair of DiNotte XML-3 lights that I have used for two years now. One on the helmet and one on the bars. I have no clue how many hours I have on them, but it’s a whole lot. I have many, many night rides and who knows how many pre-dawn rides lasting between 1.5 and 2.5 hours each. I can’t begin to say how extraordinarily pleased that I am with these lights. They have survived cold winter rides and blistering Texas summer rides. I have used them on road bikes, but mostly mountain biking. They have been used in daytime for awareness on road rides in 100+ degree days for hours. Only now am I beginning to see battery duration decline. It actually seems to have come on pretty quickly, but it’s manageable. I need to start thinking about battery replacement. These replacement batteries are not cheap, but they have delivered many dependable hours of riding. They get my highest rating! When you say the beam has an excellent color, is it less blue than some of the other lights, more like a neutral white? Do we have an updated test showing the 2000lm’s?